Arcadia Chandra International finds its humble roots in its original and parent company, Chandra & Associates, whose 40+ years of expertise makes it one of Asia and North America's leading engineering and construction firms. Founded by Southeast Asia's "Father of Value Engineering," Dr. Suriana Chandra CVS, Chandra & Associates established itself as a pioneer in Value Engineering, Value Analysis and Value Management in Southeast Asia, before expanding into North America and China. As both investor and consultant, Arcadia Chandra International provides an extensive list of services, including successful implementation of Value Engineering strategies, Construction Engineering expertise and Project Funding in the areas of Real Estate, Technology, Renewable Resources, Transportation, Urban Development and Medicine. 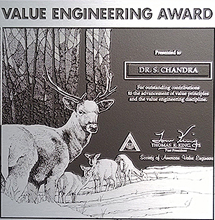 For his oustanding contributions to the advancement of Value Principles and the Value Engineering Discipline, Dr. S. Chandra was given the Value Engineering Award from SAVE (Society of American Value Engineers).